12/25/13 – Sharp pain on shunt valve multiple times starting at 2:38am, 6:40am-7:03am, 7:11am, 7:36am-7:38am, 8:02am, 9:52am-9:55am, 10:05am (multiple times) 11:24am, 12:38pm-12:40pm, 1:05pm, 1:39pm, 5:25[m. 5:59pm-6:02pm, 7:05pm, 7:55pm-7:58pm, 8:16pm, 11:30pm. Pain in stomach starting around 6:40am. Sharp pain on distal catheter (top left of head) around 5:30am. My shunt log is 14 pages. I've been recording my shunt's activity sine July 2013. ( back of head felt full of pressure when moving from side to side) Sharp pains on shunt valve multiple times between 8:20pm – 12:46am. I returned home from the hospital yesterday 12/7. The pains in my stomach have returned today in addition to actual headaches, fluid in my forehead and throbbing on the shunt valve. I was hooked up to a catheter in my left hand for two days so I wouldn't get dehydrated. On day three (12/4) An Intracranial pressure monitor and bolt (see right side image) had been placed and screwed into my head for 2.5 days in order to measure the intracranial pressure inside my head. 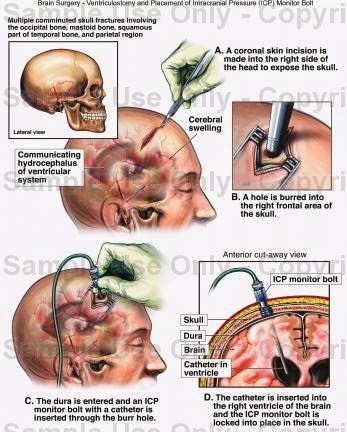 The only image I could find online that explains what the ICP does. RN: "Can you get me a bed?" Driver: "No, because I'm busy right now. I have to take this patient to the Neuro ICU." RN: "Well, you need to get me a bed." Driver: "Can you believe the nerve of her asking me to just get her a bed? As if she had the right to just order me around. She wasn't going anything. Why couldn't she get it herself?" Me: "I agree. I mean you're obviously in the middle of something right now. As if you were obligated to help her." Some people like to abuse their powers or sense of power. I arrived in the Neuro ICU around 9pm. I had a corner bed by a window. The window however, was blocked by a building so I couldn't see too many clouds. The woman across from me was an elderly woman who had just had brain surgery. She tried to pull out both of the IV's in her arm. The nurses kept telling her not do to. At one point they took out the arm restraints so she wasn't able to move her arms. RN: "He died this morning at 3:45am"
NA: "Really? Why didn't anyone tell me?" RN: "Oh. I thought it was self-explainatory." My shunt pain was bothering me on my first night in the NEURO ICU. I was given two percocet. The pain didn't go away until two hours later and was only diminished until I feel asleep. The 2nd night I had another episode and was given two additional percocet which didn't get rid of the pain completely. I was given a morphine pill around 11pm. I've had this same problem at home when I get the shunt pain. I take two advil and the pain doesn't subside until more than 2 hours later only to be relieved by sleep so it can happen again multiple times the following day. The morphine pill eliminated all the pain I had for that evening. I was moved around 12am to the out patient ICU. The older woman next to me had undergone back surgery and was in a lot of pain. She wouldn't let anyone touch her. I spoke with the night nurse, Lucy who was from Ireland. She had never planned on coming to the states. She was counting down the weeks until she was transferred to the Trauma ICU where she felt she could help the patients more. In her opinion she couldn't really help the patients in the Neuro ICU because of their specific injuries. A new shunt for the Holidays? Since last Wednesday, I haven't had much of an appetite. Most likely due to the csf fluid not properly re-absorbing into my stomach and re-circulating around my body like it's suppose to. I've had severe stomach pains since the middle of last week where I've felt my stomach convulse in very strange ways. I've felt the catheter in my stomach clog up several times. All of this in combination with the pains in my neck and head. I've mentioned in past posts that the catheters in my neck and stomach need to be replaced as they've been in place since 1993. Perhaps after the tests I'll get tomorrow, I'll get some new hardware. Having to deal with this again so soon upsets me. It will be my third shunt revision in 4 years. It will be nice to not feel the shunt, as it's been giving me issues since July.